The winner’s trophy for the 24 Hours of Le Mans has found a new home at the Porsche Museum. After three overall victories in a row in the toughest long-distance race in the world, Porsche has now earned the right to keep the challenge trophy forever. The Le Mans winners and Porsche 919 Hybrid works drivers Timo Bernhard (DE), Neel Jani (CH) and Nick Tandy (GB), and the Vice President LMP, Fritz Enzinger, have today officially entrusted the statue, which weighs almost 50 kg, to the Porsche Museum. It was received by Oliver Blume, Chairman of the Executive Board of Porsche AG, along with Chairman of the Works Council and Deputy Chairman of the Supervisory Board Uwe Hück. It can now be viewed as part of the permanent exhibition. Over the last four years, the Porsche LMP team has made motorsport history in the FIA World Endurance Championship (WEC). Since its debut in the 6 Hours of Silverstone in April 2014, the innovative Porsche 919 Hybrid has managed to come out on top in 17 of the 34 WEC races in which it has competed. That includes seven one-two finishes for the Class 1 prototype which boasts over 900 hp, which also started in pole position 20 times as the fastest car in qualifying, and drove the fastest lap in 13 races. 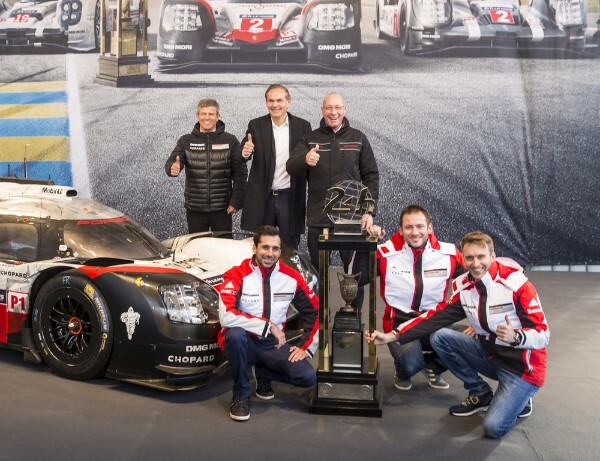 Even more importantly, this technology champion, powered by two hybrid systems, allowed Porsche to claim victory in both the overall World Championships and in the season highlight, the famous 24 Hours of Le Mans, in each of 2015, 2016 and 2017. In 2015, Formula 1 driver Nico Hülkenberg (DE) gave the vehicle a perfect debut in the classic long-distance race. After a strong performance during the night alongside Earl Bamber (NZ) and Nick Tandy (GB), he drove the 919 Hybrid first across the finish line of the “Circuit des 24 Heures”. One year later, Romain Dumas (FR), Neel Jani and Marc Lieb (DE) put so much pressure on their leading rival in a thrilling pursuit that the rival car crashed just minutes before the end of the race. And in June this year, after an early setback, Earl Bamber, Timo Bernhard and Brendon Hartley (NZ) secured Porsche its 19th overall victory in Le Mans with a fantastic comeback. The Porsche 919 Hybrid is the most complex racing car that Porsche has built in its 70-year history. With its 800-volt technology and many other developments, it has also served as a test laboratory on wheels for important future-oriented innovations. These innovations provide essential foundations for the sports car of the future, the purely electric series version of the Mission E concept study. The active WEC career of the Porsche 919 Hybrid came to an end with the 6 Hours of Bahrain in November. In the coming year, it will complete an extensive farewell tour comprising numerous individual events. In the autumn of 2018, the 919 will make its final journey – to the Porsche Museum. In 2018, the Porsche LMP team will concentrate on its new job – making a successful entry into Formula E. This will take place in time for season six, which begins at the end of 2019. In the meantime, the team has a complete drivetrain to design, develop and test.